Writers are having an identity crisis right now. Should we self-publish? Should we keep hoping for a traditional publisher’s attention? When everyone can publish books, what does being a writer mean? Like most other English professors at most other universities, Professor Nick Educht spent his spare time hunched over his computer like a caveman trying to start a fire. He would occasionally stroke his graying stubble with the palm of his hand and look distantly out the window into the bright fall morning, then proceed to curse. His novel, The Microcosm of Time, sat on the monitor. It was a half-finished jumble of topographical arithmetic: stunted paragraphs like trees that had never seen sunlight, two-dimensional characters who vomited platitudes, underdeveloped themes like unfurnished buildings. The more he stared at the blinking cursor, the more delirious he felt. The monitor itself seemed to lurch toward him, yawning open like a cave of white light. Professor Educht shook his head violently, sending his locks of curly brown hair into a frenzy. With some sense of relief, he let his hand land on the mouse. He rested it there passively for a moment, then steered the cursor away from the document and onto the Internet Explorer icon. The internet opened up in front of him, a great flood of words, pictures, and stimulatory relief. With a sharp sense of satisfaction, he read something about how someone in the government had said something that would irreparably damage his campaign. He skipped the last few paragraphs and checked his email. He lingered on a message from his sister, a doctor in Houston. The sheer immensity of her email, the studs of periods and curvaceous ballerinas of question marks, all served to overwhelm him. He squinted, trying to comprehend a sentence about how his niece had gotten into trouble with her school or sports team, then went onto YouTube to watch videos of his favorite, long-dead jazz musicians. These were artists whose talent and names had more or less turned to dust upon their death, whose mournful tunes Professor Educht jealously clutched to his heart, resentful of anyone else he knew who would even dare suggest that they, too, knew of Ryder Jerry or Barry Sage. Fellow YouTube viewers clearly felt the same vindicated sense of appreciating the unappreciated, blurting uncapitalized, unpunctuated croaks of indignation at the world’s apathy for Real Art. The summer was supposed to be Professor Educht’s time to finish his novel. He had finally won tenure at Benston College for his ground-breaking thesis on why The Brothers Karamazov had to be exactly as long as Fyodor Dostoyevsky had written it. The paper had been called No More, No Less and received the Gold Star of Literary Excellence from The Literarium Review, one of the most highly regarded magazines in the world of English professors. Benston College finally released him from the limbo of teaching Modern English 101 to football players trying to invite timid girls to parties and math majors whose no-nonsense words fell onto the page like bags of marbles. Professor Educht was given permission to start his very own Specialty Seminar, the kinds of classes frequented by students who had declared their majors and were now aimlessly rooting for knowledge not in the wide, open spaces of library shelves and mainstream literature and Wikipedia, but in the crevices and corners, the spaces between radiators that burned lesser-read individuals, the dark places under the bed that would make you cough as you inhaled robust, dust balls of Knowledge. Professor Educht launched his Specialty with enthusiasm. At forty-two, he felt that he was closer in age to the students than the other English professors, who were in their fifties and sixties and had long ago retreated into the basements of their specialized intelligence, hiding from change like people in bomb shelters. Professor Educht tried to endear himself to students by making a Twitter account and following them, occasionally tweeting literary news and short stories at them. Students felt threatened by Educht’s adoption of social media and decided he was “creepy,” particularly when he carefully took a picture of himself in the mirror, made it his profile picture on Facebook, and attempted to Friend them. Each class, both the students and Educht knew that his Friend Request loomed, unrequited, on their Facebook Profiles. Neither party broached the silence on the subject. After two weeks of vigorously trying to engage with his students, Educht sank back into the sullen, mumbling professor he had been before tenure. He went back to impatiently grading papers beside his computer while trying to write The Microcosm of Time. Yet it seemed that every hour, there was another warbling student emailing him about how he or she couldn’t get an essay in on time or felt too sick to go to class. This was also when Professor Educht discovered that he could look at old girlfriends on Facebook and prey on famous writers on Twitter, so he naturally had even more trouble concentrating on his novel. Instead, he consumed articles about the death of books and bookstores and publishers and authors with an almost perverse pleasure, submitting to the existential hypothesis that it was now impossible to publish a book if you hadn’t published one before and weren’t writing something that had a Commercial Plot, around which the theme and characters could orbit like wayward planets around a sun. 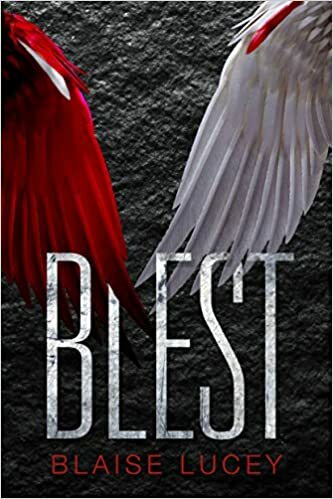 “My friend Barbara just published her book,” Virginia said at dinner one night, talking over the pterodactyl-like calls of their five-year-old son, Brian, as he proclaimed that he hated peas. 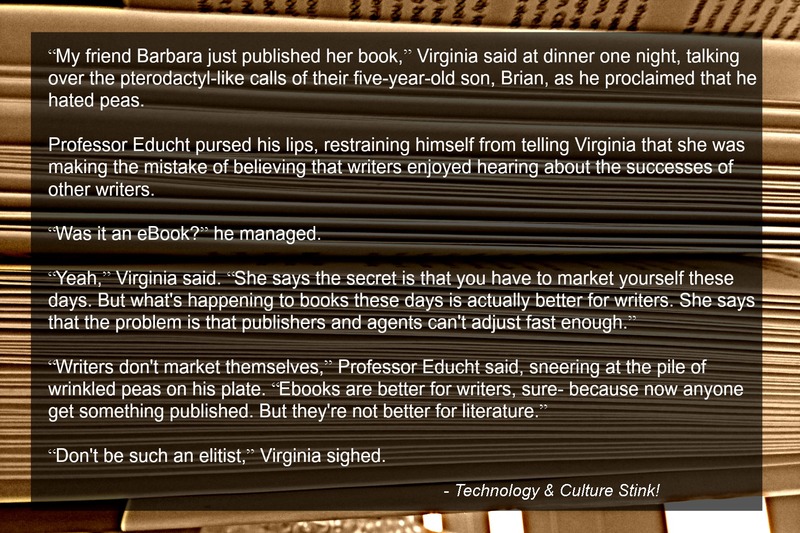 Professor Educht pursed his lips, restraining himself from telling Virginia that she was making the mistake of believing that writers enjoyed hearing about the successes of other writers. “Was it an eBook?” he managed. “Don’t be such an elitist,” Virginia sighed. A bony blond who was thirty-eight, Virginia was often thought to be out of Professor Educht’s league. Yet the matrimonial variables of early thirties’ panic and having a weakness for shy academics had combined to form a happy marriage. Having been married to Professor Educht for almost six years, Virginia had grown habituated to his bursts of solipsism, the sentences that swung like battering rams through her carefully constructed castles of etiquette, optimism, and pragmatism. Even when she was dating Professor Educht, back when he was only known as Nick Educht, Virginia foresaw the distinct possibility that he wouldn’t publish something and he would take it out on the world. She wondered, sometimes, if she loved him because he was a writer or despite the fact he was a writer. Virginia smoothly plucked his glass of wine from the table and placed it next to her plate. Professor Educht chuckled, Virginia giggled. Brian laughed with them. Although Professor Educht had owned a smartphone for several months after a tattooed twentysomething girl with pink hair assured him it was “an upgrade,” he hadn’t used it for more than phone calls, photos, and directions. When he realized that he could access Facebook and Twitter from it, he immediately installed the applications and spent hours sitting in the living room, scrolling through pictures of his high school girlfriend or his two college flings, petrified that he would accidentally swipe the “Like” button with his thumb and leave his mark there, like a careless predator breaking a twig and startling a deer. He also enjoyed using Wikipedia during his weekly meals with the other English professors. They would be debating the finer points of Shakespeare or Foucault and he could immediately summon his smartphone. It made him the arbiter of each argument, an impartial spectator with the sole power to judge. So, at the table in the college cafeteria, over soggy chicken patties and lumps of coleslaw, he became respected and feared by his colleagues. By mid-October, Professor Educht had 642 followers on Twitter and 145 Friends on Facebook. He was adored for his insightful, literary tweets and lauded for his sarcastic status updates on Facebook. An update such as “Just got out of another 201 class where exactly zero people participated. Dickens had no idea what was ahead when he wrote Hard Times, these are the real hard times!” received an average of two to three Likes. It was a rainy fall evening, a Saturday, when Professor Educht picked up The Brothers Karamazov and decided that he wanted to read the book for the forty-second time. He even decided that he could experiment with having his smartphone on the table next to his reading chair, fantasizing that it could serve as a reading companion. He reasoned that, whenever he wanted to look up an analysis or a paper or a key moment in Dostoyevsky’s life, he could immediately tap his way there. This was his idea of a high-octane evening. Professor Educht’s reading hours were generally 11pm to 1am, when Virginia and Brian were asleep. He occasionally managed to sneak some reading in during the weekends as well, fumbling with a book like a teenage lover at bra straps as Virginia played a game with Brian in the other room. This was always a pulse-pounding risk for him, because Professor Educht knew that, sooner or later, Virginia would find him and accuse him of being “uninvolved.” As he reflected on Virginia’s unreasonable expectations of a father’s duties, he realized that this habit had tapered off ever since he had gotten his smartphone and started using social media. In fact, he couldn’t remember when he had last read a book at all. He sighed and put his book face-down on the armrest, keeping it open, and tweeted something clever about “reader’s block.” He checked his email on his phone. Several students had said that they would be unable to make it to Monday’s Specialty Seminar. One said something about family issues, one had a cross-country race. Like a hesitant traveler staring at a crossroad, Professor Educht tapped his way deeper into the jungle of the internet. He peeled away the foliage of YouTube and swung from news site to news site like a chimpanzee from vines, even issuing several delighted hoots at particularly nasty comments left by similar apes, apes who had peered at the same website and decided to howl at each other in the “Comments” section. His journey led him to an app store, where he found several free games that he played late into the night. Soon, it was 1am. The Brothers Karamazov lay untouched on the armrest. Professor Educht blinked and put his smartphone down, feeling as if he had just awoken from a paralytic state of shock with the anticlimactic flip of a switch, as if his brain had just been pulled, wet and wriggling, from a confusing and fast-moving current. The grandfather clock groaned to announce the new hour, a primordial voice that boomed throughout the house, reverberating in Educht’s chest. “I never have enough time,” he growled as he got up to brush his teeth. Like what you see here? Read the rest from my short story collection! 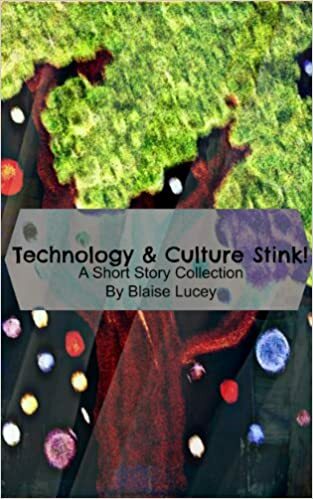 This entry was posted in Fiction, Rants, Technology and tagged ebooks, fiction, satire, self-publish, short stories, short story, social media, writing. Bookmark the permalink.